Eye movement in two seconds. Six extraocular muscles facilitate eye movement. These muscles arise from the common tendinous ring in the orbit, the eye cavity, and attach to the eyeball. The six muscles are the lateral, medial, inferior and superior rectus muscles, and the inferior and superior oblique muscles. The muscles, when contracting, cause movement of the eyeball, by pulling the eyeball towards the muscle. 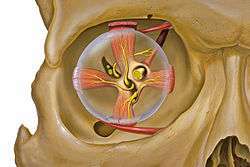 For example, the lateral rectus is on the lateral side of the eyeball. When it contracts, the eyeball moves so that the pupil looks outwards. The medial rectus causes the eyeball to look inwards; the inferior rectus downwards and the superior rectus upwards. The superior oblique muscle and inferior oblique muscle attach at angles to the eyeball. Most muscles not only move the eye in a cardinal direction, but also slightly rotate the pupil. The muscles are supplied by the oculomotor nerve, with the exception of the superior oblique, which is supplied by the trochlear nerve, and the lateral rectus, supplied by the abducens nerve. Schematic demonstrating the actions and cranial nerve innervation (in subscript) of extraocular muscles. Three antagonistic pairs of muscles control eye movements: the lateral and medial rectus muscles, the superior and inferior rectus muscles, and the superior and inferior oblique muscles. These muscles are responsible for movements of the eye along three different axes: horizontal, either toward the nose (adduction) or away from the nose (abduction); vertical, either elevation or depression; and torsional, movements that bring the top of the eye toward the nose (intorsion) or away from the nose (extorsion). Horizontal movements are controlled entirely by the medial and lateral rectus muscles; the medial rectus muscle is responsible for adduction, the lateral rectus muscle for abduction. Vertical movements require the coordinated action of the superior and inferior rectus muscles, as well as the oblique muscles. The relative contribution of the rectus and oblique groups depends on the horizontal position of the eye. In the primary position (eyes straight ahead), both of these groups contribute to vertical movements. Elevation is due to the action of the superior rectus and inferior oblique muscles, while depression is due to the action of the inferior rectus and superior oblique muscles. When the eye is abducted, the rectus muscles are the prime vertical movers. Elevation is due to the action of the superior rectus, and depression is due to the action of the inferior rectus. When the eye is adducted, the oblique muscles are the prime vertical movers. Elevation is due to the action of the inferior oblique muscle, while depression is due to the action of the superior oblique muscle. The oblique muscles are also primarily responsible for torsional movements. The brain exerts ultimate control over both voluntary and involuntary eye movements. Three cranial nerves carry signals from the brain to control the extraocular muscles. Three nerves control the eye muscles. These are the oculomotor nerve, which controls the majority of the muscles, the trochlear nerve, which controls the superior oblique muscle, and the abducens nerve, which controls the lateral rectus muscle. In addition to the movement of muscles, numerous areas in the brain contribute to involuntary and voluntary eye movements. These include providing the conscious perception of vision, as well as areas that facilitate tracking. They may be classified according to the involvement of one or both eyes; involving one eye they may be classified as duction, and both eyes either version, if moving in the same direction, or vergence, if moving in opposite directions. They may be classified as fixational, gaze-stabilizing, or gaze-shifting. Gaze-stabilising movements may include the Vestibulo-ocular reflex and Optokinetic reflex, and gaze-shifting mechanisms as saccades and pursuit movements. Pursuit Movements or Smooth pursuit are the movements that the eyes make while tracking an object's movement, so that its moving image can remain maintained on fovea. Additionally, the eyes are never completely at rest. They make fast random jittering movements even when we are fixated on one point. The reason for these random movements are the photoreceptors and the ganglion cells. It appears that a constant visual stimulus can make the photoreceptors or the ganglion cells become unresponsive; on the other hand a changing stimuli will not. Therefore, these random eye movements constantly change the stimuli that fall on the photoreceptors and the ganglion cells, making the image more clear. Saccades are the rapid movement of eyes that is used while scanning a visual scene. In our subjective impression, the eyes do not move smoothly across the printed page during reading. Instead, our eyes make short and rapid movements called saccades. During each saccade the eyes move as fast as they can and the speed cannot be consciously controlled in between the stops. The movements are worth a few minutes of arc, moving at regular intervals about three to four per second. One of the main uses for these saccadic eye movements is to be able to scan a greater area with the high-resolution fovea of the eye. The visual system in the brain is too slow to process that information if the images are slipping across the retina at more than a few degrees per second. Thus, to be able to see while we are moving, the brain must compensate for the motion of the head by turning the eyes. Another specialisation of visual system in many vertebrate animals is the development of a small area of the retina with a very high visual acuity. This area is called the fovea, and covers about 2 degrees of visual angle in people. To get a clear view of the world, the brain must turn the eyes so that the image of the object of regard falls on the fovea. Eye movements are thus very important for visual perception, and any failure to make them correctly can lead to serious visual disabilities. To see a quick demonstration of this fact, try the following experiment: hold your hand up, about one foot (30 cm) in front of your nose. Keep your head still, and shake your hand from side to side, slowly at first, and then faster and faster. At first you will be able to see your fingers quite clearly. But as the frequency of shaking passes about 1 Hz, the fingers will become a blur. Now, keep your hand still, and shake your head (up and down or left and right). No matter how fast you shake your head, the image of your fingers remains clear. This demonstrates that the brain can move the eyes opposite to head motion much better than it can follow, or pursue, a hand movement. When your pursuit system fails to keep up with the moving hand, images slip on the retina and you see a blurred hand. The brain must point both eyes accurately enough that the object of regard falls on corresponding points of the two retinas to avoid the perception of double vision. In most vertebrates (humans, mammals, reptiles, birds), the movements of different body parts are controlled by striated muscles acting around joints. The movements of the eye are slightly different in that the eyes are not rigidly attached to anything, but are held in the orbit by six extraocular muscles. When reading, the eye moves continuously along a line of text, but makes short rapid movements (saccades) intermingled with short stops (fixations). There is considerable variability in fixations (the point at which a saccade jumps to) and saccades between readers and even for the same person reading a single passage of text. Eye movement in music reading is the scanning of a musical score by a musician's eyes. This usually occurs as the music is read during performance, although musicians sometimes scan music silently to study it, and sometimes perform from memory without score. Eye movement in music reading may at first appear to be similar to that in language reading, since in both activities the eyes move over the page in fixations and saccades, picking up and processing coded meanings. However, music is nonlinguistic and involves a strict and continuous time constraint on an output that is generated by a continuous stream of coded instructions. Eye movement in scene viewing refers to the visual processing of information presented in scenes. A core aspect of studies in this area is the division of eye movements into the rapid movement of the eyes (saccades), and the focus of the eyes on a point (fixations). Several factors can influence eye movement in scene viewing, including the task and knowledge of the viewer (top-down factors), and the properties of the image being viewed (bottom-up factors). Typically, when presented with a scene, viewers demonstrate short fixation durations and long saccade amplitudes in the earlier phases of viewing an image. This is followed by longer fixations and shorter saccades in the latter phases of scene viewing processing. It has also been found that eye movement behaviour in scene viewing differs with levels of cognitive development - fixation durations are thought to shorten and saccade amplitudes lengthen with an increase in age. Where eye movements fixate is affected by both bottom-up and top-down factors. Even an initial glimpse of a scene has an influence on subsequent eye movements. In bottom-up factors, the local contrast or prominence of features in an image, such as a large contrast in luminance or a greater density of edges, can affect the guidance of eye movements. However, the top-down factors of scenes have a greater impact in where eyes fixate. Areas containing more meaningful features, or areas where colour aids the discrimination of objects, can influence eye movements. Images which are related to previous images shown can also have an effect. Eye movements can also be guided towards items when they are heard verbally at the same time as seeing them. Cross-culturally, it has been found that Westerners have an inclination to concentrate on focal objects in a scene, whereas East Asians attend more to contextual information. Average fixation durations last for about 330 ms, although there is a large variability in this approximation. This variability is mostly due to the properties of an image and in the task being carried out, which impact both bottom-up and top-down processing. The masking of an image and other degradations, such as a decrease in luminance, during fixations (factors which affect bottom-up processing), have been found to increase the length of fixation durations. However, an enhancement of the image with these factors also increases fixation durations. Factors which affect top-down processing (e.g. blurring) have been found to both increase and decrease fixation durations. 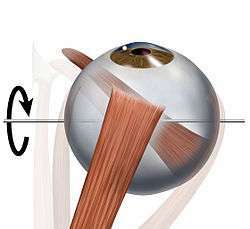 Incyclotorsion is a term applied to the inward, torsional (rotational) movement of the eye, mediated by the superior oblique muscle of the eye. The superior oblique muscle is innervated by cranial nerve IV (trochlear nerve). Incyclotorsion may also be used to describe one part of the condition of the eye when a patient has an oculomotor nerve palsy. The oculomotor nerve (cranial nerve III) supplies the inferior oblique muscle (along with four other eye muscles – superior rectus, medial rectus, inferior rectus and the striated muscle of levator palpebrae superioris), and when this muscle is non-functional (as in oculomotor palsy) the eye incyclotorts; i.e. twists/rotates inward. Excyclotorsion is a term applied to the outward, torsional (rotational) movement of the eye, mediated by the inferior oblique muscle of the eye. The inferior oblique muscle is innervated by cranial nerve III (oculomotor nerve). Excyclotorsion may also be used to describe the condition or state of the eye when a patient has a cranial nerve IV (trochlear nerve) palsy. The trochlear nerve supplies the superior oblique muscle, and when this muscle is non-functional (as in trochlear palsy) the eye excyclotorts; i.e. twists/rotates outward. This excyclotorsion may be corrected through surgery using the Harada-Ito procedure. ↑ Pierrot-Deseilligny, Charles; Milea, D.; Muri, R. M. (2004). "Eye movement control by the cerebral cortex". Current Opinion in Neurology. 17 (1): 17–25. doi:10.1097/00019052-200402000-00005. PMID 15090873. ↑ Krauzlis RJ (Apr 2005). "The control of voluntary eye movements: new perspectives" (PDF). The Neuroscientist. 11 (2): 124–37. doi:10.1177/1073858404271196. PMID 15746381. ↑ Heinen SJ, Liu M (Sep–Oct 1997). "Single-neuron activity in the dorsomedial frontal cortex during smooth-pursuit eye movements to predictable target motion". Vis Neurosci. 14 (5): 853–65. doi:10.1017/s0952523800011597. PMID 9364724. ↑ Tehovnik EJ, Sommer MA, Chou IH, Slocum WM, Schiller PH (April 2000). "Eye fields in the frontal lobes of primates". Brain Res. 32 (2-3): 413–48. doi:10.1016/s0165-0173(99)00092-2. PMID 10760550. ↑ Robinson FR, Fuchs AF (2001). "The role of the cerebellum in voluntary eye movements". Annu Rev Neurosci. 24: 981–1004. doi:10.1146/annurev.neuro.24.1.981. PMID 11520925. 1 2 Kanski, JJ. Clinical Ophthalmology: A Systematic Approach. Boston:Butterworth-Heinemann;1989. ↑ Westheimer Gerald; McKee Suzanne P. "Visual acuity in the presence of retinal-image motion". Journal of the Optical Society of America". 1975. 65 (7): 847–50. doi:10.1364/josa.65.000847. ↑ Pannasch S.; Helmert J.; Roth K.; Herbold A.-K.; Walter H. (2008). "Visual Fixation Durations and Saccade Amplitudes: Shifting Relationship in a Variety of Conditions". Journal of Eye Movement Research. 2: 1–19. ↑ Helo A.; Pannasch S.; Sirri L.; Rämä P. (2014). "The maturation of eye movement behaviour: scene viewing characteristics in children and adults". Vision Research. 103: 83–91. doi:10.1016/j.visres.2014.08.006. ↑ Castelhano M.; Henderson J. (2007). "Initial Scene Representations Facilitate Eye Movement Guidance in Visual Search". Journal of Experimental Psychology: Human Perception and Performance. 33: 753–763. doi:10.1037/0096-1523.33.4.753. ↑ Itti L.; Koch C. (2000). "A saliency-based search mechanism for overt and covert shifts of visual attention". Vision Research. 40: 1489–1506. doi:10.1016/s0042-6989(99)00163-7. ↑ Parkhurst D. J.; Law K.; Niebur E. (2002). "Modeling the role of salience in the allocation of overt visual attention". Vision Research. 42: 107–123. doi:10.1016/s0042-6989(01)00250-4. ↑ Mannan S.; Ruddock K.; Wooding D. (1996). "The relationship between the locations of spatial features and those of fixations made during visual examination of briefly presented images". Spatial Vision. 10: 165–188. doi:10.1163/156856896x00123. ↑ Onat S.; Açik A.; Schumann F.; König P. (2014). "The Contributions of Image Content and Behavioural Relevancy to Overt Attention". PLOS ONE. 9: e93254. doi:10.1371/journal.pone.0093254. ↑ Amano K.; Foster D. (2014). "Influence of local scene color on fixation position in visual search". Journal of the Optical Society of America A. 31: A254–A261. doi:10.1364/josaa.31.00a254. ↑ Henderson J.; Weeks Jr.; Hollingworth A. (1999). "The Effects of Semantic Consistency on Eye Movements During Complex Scene Viewing". Journal of Experimental Psychology: Human Perception and Performance. 25: 210–228. doi:10.1037/0096-1523.25.1.210. ↑ Staub A.; Abbott M.; Bogartz R. (2012). "Linguistically guided anticipatory eye movements in scene viewing". Visual Cognition. 20: 922–946. doi:10.1080/13506285.2012.715599. ↑ Chua H.; Boland J.; Nisbett R. (2002). "Cultural variation in eye movement during scene perception". Proceedings of the National Academy of Sciences of the United States of America. 102: 12629–12633. ↑ Henderson J (2003). "Human gaze control during real-world scene perception". Trends in Cognitive Science. 7: 498–504. doi:10.1016/j.tics.2003.09.006. ↑ Henderson J.; Pierce G. (2008). "Eye movements during scene viewing: Evidence for mixed control of fixation durations". Psychonomic Bulletin & Review. 15: 566–573. doi:10.3758/pbr.15.3.566. ↑ Henderson J.; Nuthmann A.; Luke S. (2013). "Eye Movement Control During Scene Viewing: Immediate Effects of Scene Luminance on Fixation Durations". Journal of Experimental Psychology: Human Perception and Performance. 39: 318–322. doi:10.1037/a0031224. ↑ Walshe R.; Nuthmann A. (2014). "Asymmetrical control of fixation durations in scene viewing". Vision Research. 100: 38–46. ↑ Henderson J.; Olejarczyk J.; Luke S.; Schmidt J. (2014). "Eye movement control during scene viewing: Immediate degradation and enhancement effects of spatial frequency filtering". Visual Cognition. 22: 486–502. doi:10.1080/13506285.2014.897662. Wehner R (2005). "Sensory physiology: Brainless eyes". Nature: 157–159.